Over 2 billion people access the web from a mobile device. 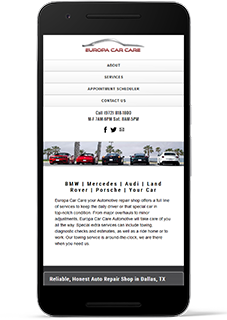 91% of Small Business Websites are not Mobile Optimized. 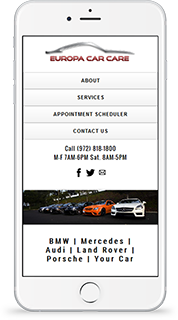 Is your website mobile-ready ? You may think your business does not need a website but your customers expect you to have one. Maintaining a website can increase your online presence and help your business reach potential clients/buyers outside of your zip code. According to PEW Research Center, 51% of adults in the U.S. rely on the internet to look up local businesses. Therefore, having a website is a MUST in today's business world. The Ultra Computer team are here to take your business to the next level. The process behind creating a shiny website is a blend of Art and Science. Our talented team will build the website that you always wanted. Our web designers will create the most unique, stunning and professional website for your business, and our web developers will incorporate the latest technologies to make sure your website gets a high ranking, is optimized to its fullest, and runs flawlessly and as smoothly as possible. The Ultra Computer provides web solutions to businesses in Dallas, Texas, in the U.S., and all around the world. From single-page websites to eCommerce websites, our innovative experts will create a custom solution that fulfils your needs and exceeds your expectations. Our highly-skilled web designers will combine functionality, with fascinating designs that will make a lasting impression on your potential clients and turn them into clients. We can help you grow your business with a modern, professional, fully responsive, search-engine optimized website. No matter what device your clients use, your website will always look at its best; clean and professional. Don't Have a Website? Your Competitor Does. Get One Today! More than 200 local businesses, non-profit organizations, and enterprises in DFW and all around the U.S. trust us with their online presence. We are more than a web design company. We maintain websites and optimize them to the fullest to get your business the best ranking and maximum exposure. Since 2007, we have been recognized as one of the leading web design & eCommerce design, and web development company in the Dallas/Fort Worth area. We gained our reputation and the trust of our clients thanks to our knowledge, commitment to meet our customers' expectations. We only charge our clients two times: Initial deposit, and Final deposit. We receive the final deposit only if our clients are 100% satisfied. Basic maintenances are free of charge to the websites that we built. For any additional work that requires major changes like redesigning or adding a new section, we will send you an invoice and a report showing total hours worked on your projects self-explanatory without any hidden fees. Your website is the most important marketing asset for your business. Therefore, we build websites that look professional, and shiny to give your visitors the best impression and turn them into customers. Whether you need to refresh your existing eCommerce web design, upgrade to a new platform, or launch a new online store. We will give your website a refreshing shiny look optimized for every device. We offer solutions for small businesses and corporations. We build web applications and programs tailored for your business needs stored on your computers or on the cloud. Our internet marketing experts will work closely with clients to maximize their performance. With the help of SEO, pay-per-click ads and great content, we strive to turn visitors into customers and real revenue.